The ECB claims that Target2 does not represent capital flight. Evidence says the ECB is wrong, especially for Italy and Spain. I have discussed this previously, but let’s recap Target2 before taking a look at new charts. A quick perusal of Target2 Balances for January shows capital flight has largely stabilized but the imbalance in Spain hit a new record. Financial Times Alphaville guest writer Marcello Minenna makes a case in pictures for what I have long stated. It’s interesting to note that Minenna is the head of Quantitative Analysis and Financial Innovation at Consob, the Italian securities regulator. 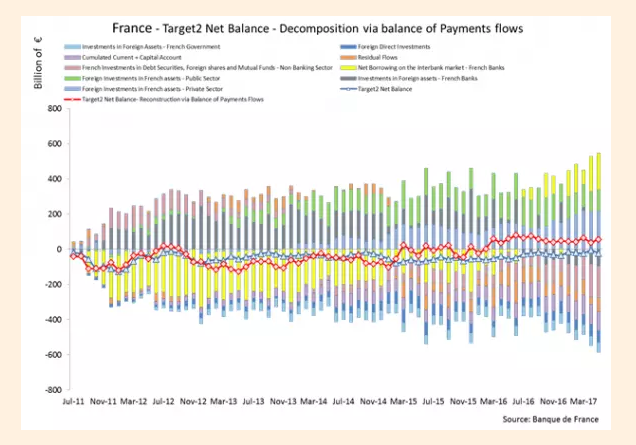 Mienna compares France with its stable Target2 balance to Italy and Spain. The red line with dots represents the imbalance. 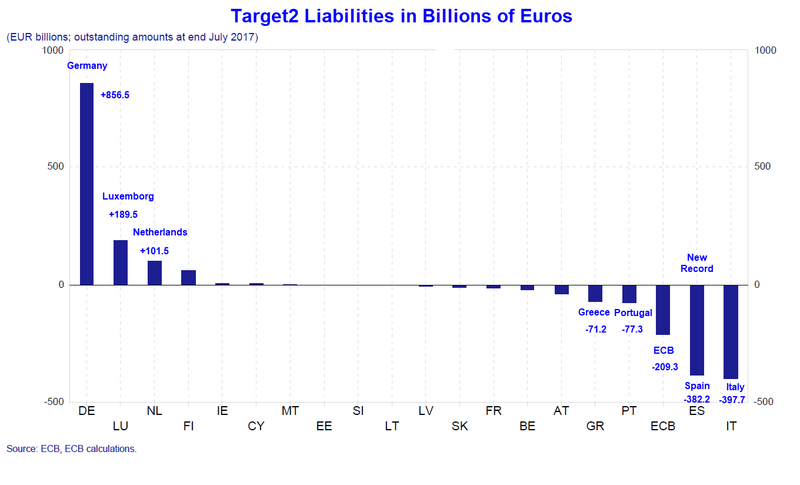 As of July France had a Target2 liability of 12.2 billion. France shows no correlation to ECB asset purchases. This is what I concluded long ago. For discussion, please see Target2 and Secret Bailouts: Will Germany be Forced Into a Fiscal Union with Rest of Eurozone? The europeans better hope and pray a country doesn’t default fully on its debts. It’s TINA – There Is No Alternative. Merkels win will result in it irrespective of AfD turnout. It will be done in the name of solidarity. If it works – OK – but there are massive risks that could show up in the ballot box in future years if they get it wrong. To this end a Europe of smaller regions (Catalonia breaking from Spain, as example) could make it easier to achieve. The zealots will force it through, people won’t matter. AfD came in 2nd place, ahead of most established parties. And CSU won by narrow margins, on poor turnout. Germans are fed up with Brussels, and every time that arrogant ferkel Merkel puts the globalist Brussels agenda ahead of the people she actually works for — it adds more people to AfD’s support base. I am sure the media will try to spin Merkel’s “win” as a mandate to further alienate European voters, but anyone who can think for themselves has to see the German vote as a defeat. A little more “success” from Merkel, and AfD will be running Germany. PS — President Trump, you still haven’t repealed Obamacare, and we deplorables don’t give a damn what Cruz or McCain think. F Cruz and F McCain. Get Obamacare repealed now. the upshot is that the ECB has created an account out of thin air where trade deficits are recorded – with goods and services bought, but not paid for, are stored – but for which no effort will ever be made to pay for. so trade deficits are never paid for and the deficit countries receive free goods and services. libtard socialism at its most intellectual, yet still a complete and utter fraud. the corrollary is that the ECB monetizes all government debt resulting from the trade deficits that indicate deficit countries are not paying their way – hence the ECB is providing unlimited export credit guarantees to surplus countries. it’s a massive balloon, waiting for a pin. 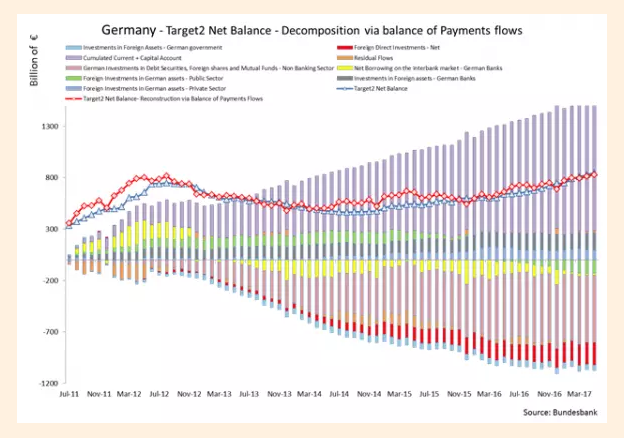 Is target2 a form of reserve balance? It sure seems that way to me. QE is just a machination where ECB (and sub-ECB central banks) “buy” crappy bonds by taking ownership of the binds AND issuing reserve credits as “payment” for the bonds (at ~ face value). Hence new reserves are created that are backed by crappy bonds. The reserves are money every bit as good as paper currency is, because shifting reserve balances between ECB member banks is how interbank payment imbalances are settled. 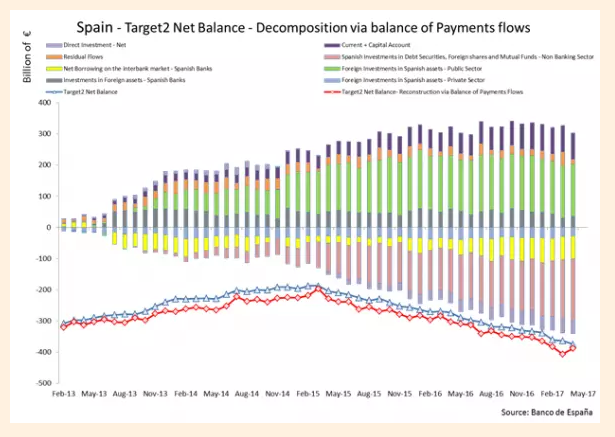 So now crappy bonds (and whatever crappy collateral they may be secured by) are the nee backing of all the new money floting aroud in the form of increased reserve balances. This is the same as QE by the FRB in the USA, but some of the terminology seems slightly different. in the classic C + G + I + (X-M) = GDP definition, (X-M) and G are fungible, hence your fiscal deficit = your trade deficit. substituting a central bank “accounting device” to obfuscate this truism, does not alter tha fact that as countries import more than they export, the shortfall winds up as debt. you can obfuscate this in other ways (as in Japan, hiding behind currency manipulation to effect transfer pricing of goods (to put american car manufacturers out of business and compete unfairly with german car makers, for example). in short, anytime a central bank is involved in trying to manipulate anything other than financial asset prices, it fails. central banks have no impact on inflation, unemployment or economic growth. asset prices globally have been lifted by around 20% (14 trillion of global qe impacting all global debt and equity markets for zero impact on anything other than bond prices/lower yields and higher equity market prices) to the detriment of savers and the benefit of borrowers. this redistribution of wealth between savers and borrowers is POLITICS – it also encourages the sale of goods for much higher credit risk, leaving sellers of products and services that need vendor financing, accidents waiting to happen. everything is fine, until all the taxes that can be pulled forward from the future, have been spent (to subsidize the failed (welfare based) system of libtard socialism). at which point the system of either germany (massive unfunded liabilities twice that of the US), the US, the UK, Canada, France, Italy or Spain collapses (bet on Spain collapsing!) bringing the global system down with it. at which point, everyone is broke and we have a depression that makes the 1930’s look like utopia.- the four horsemen. Ok, I think I understand it now, TARGET2 is actually a payment settlement system, not a capital tier of the banks. And just as in the US/FRB system, the currency of payment are the reserves on deposit with the central bank(s), reserves owned by the member (commercial) banks. Bundesbank and other ECB-sub-banks have been accepting crappy bonds as backing for new reserves (QE). The banks in the surplus countries (Germany, Netherlands,…) have been credited the reserves backed by the crappy bonds issued in/by the debt-ridden deficit countries (Greece, Italy, Portugal, Spain). 1. They get to break all the rules without complaint. 2. They lower the value of the euro with QE and low rates. 3. They ensure endebted countries can pay. 4. They ensure creditors get paid. 5. They enable creditor countries to buy into endebted countries at low prices. 6. They hold political sway by being able to restrict/enable finance to endebted countries. If you wanted to take over another country it would seem the way to do so. By building an unbalanced mutual dependency ( no contradiction as the framework is mutual, the result unbalanced) , someone is always going to have the upper hand, and the other to be able to imagine they do. Sounds like a sweet deal for the GIPS. An indirect bailout of the GIPS by the stronger German and Dutch economies. Because of its arcane nature, I suspect Dutch and German voters do not notice it. Also, seems like an incentive to keep the GIPS in the EU. With this kind of stealth bailout, why would the GIPS leave the EU or abandon the euro? Former chief economist of the Bank for International Settlements, William White, told Bloomberg TV recently that “the system is dangerously unanchored.” The fact the Euro-zone has not addressed its banking problems is still a major issue. What stood out in my mind was his indication that central banks cannot or will not be able to solve what might be seen as a growing “liquidity problem.” This will result from debt that continues to go bad. Hans-Werner Sinn understands and explains the details of how the system works but is not willing to admit the primary cause of the problem: persistent large trade/current account surpluses by Germany and Netherlands. Germany exports a lot, which results in large money inflows. However, they do not spend the money so it piles up and must go somewhere. Unless private and institutional investors (e.g. pension funds) buy sufficient debt and assets outside the Eurozone the excess money is necessarily forced into the other Eurozone countries. Unless Germany etc. are willing to spend the money (eliminate their current account surpluses) there is no way for the peripheral countries to pay back the debt. In conclusion, it appears that Germany would prefer to lose the money than spend it. If they really have nothing they want to spend the money on perhaps they should just give it away. Wait a moment, explain me where is the problem if italian savers implement what is usually thougth as wise behavior: diversification of their investments! The outflows of cash/capital from domestic investors has on the flip side more assets in theirs portfolios, as stated from the positive and growing balance of the primary income (dividends from investments abroad). Why look only to the flux registered by the system of payments (Target2) and not to the bigger and richer portfolio of investments/assets? This is an opposite case to the “classic” outflows of capital from a country implemented by foreigners investors. How can that ever be paid back? It can’t! But the ECB guarantees it. Hi, thank you for responding me. But I understand that there is a misunderstanding of the nature of Target2 system. When an italian saver invest in a foreign asset, share or obligation, he/she has the money in the account, money transferred to the account of the foreign residend that sell the asset via Target2. Central banks are in the middle and in Europe the framework of Target2 “register” the flux. So it is a matter of tecnicalities of central bank money, not debt! Do you pay twice for one item/investment? Because is excactly what you state in your response saying Italy “owe” x billion to Germany. I’m talking only about Italy because I have data regarding her. 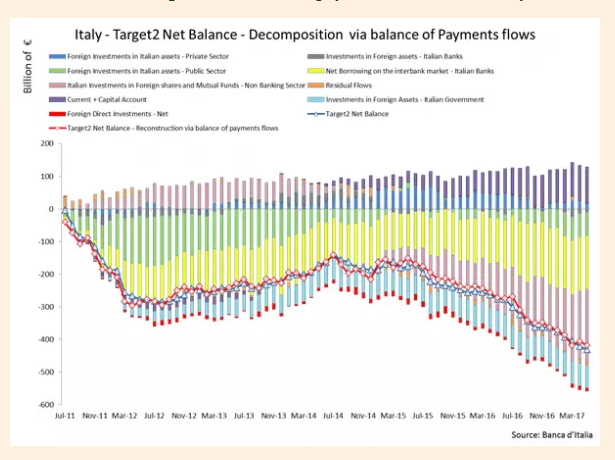 For example look to the last BankofItaly report on italian balance of payment, it shows a big trading surplus obtained with huge contribution of goods trade but with positive and growing primary income as well. Primary income returning flux due to the dividends and interests gained on foreign investment. For a comprehensive assesment of the situation I think you can’t ignore the whole “story”. Germany’s trade surplus doesn’t seem to be the primary problem, can that really be true? It seems peripheral countries must find a way to manage their budgets in accordance with their revenues. If a country has a trade deficit does it automatically conclude the same country should be debt ridden? The bigger german economic partners with the bigger trade deficit are USA, UK and France, all with huge debts driven economies. So the answers to your question should be yes. Except for the “peripheral” matter, that seems not important.